Lockout/Tagout | Hercules Industries, Inc.
Locking out equipment during maintenance and change-over has not only prevented accidents, but also saved lives. Lockout/Tagout is the law. If you have not started a Lockout/Tagout program yet, start one today. If you already have a Lockout/Tagout program, see what we have to offer. You can specify the number of keys. A colored tag comes standard with every lock. Use to separate departments or note special caution. Each tag can have your employees’ name or department stamped on it. If an employee retires or leaves the company, simply replace the tag and continue to use the lock. Colors are available in red, blue, green, purple, orange and bronze. 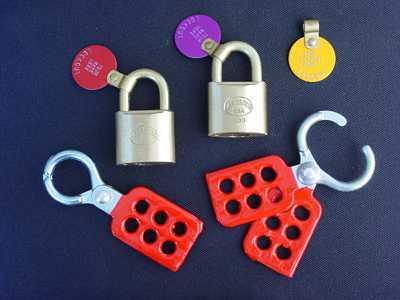 Poly resin coated lockouts are available in aluminum or steel. Painted locks are available on request. You can remain OSHA compliant!